A simple lighted candle can lift your spirits with a wonderful smell and warm glow it offers. Flickering candles seem so soothing to me and a little bit indulgent in a small way. 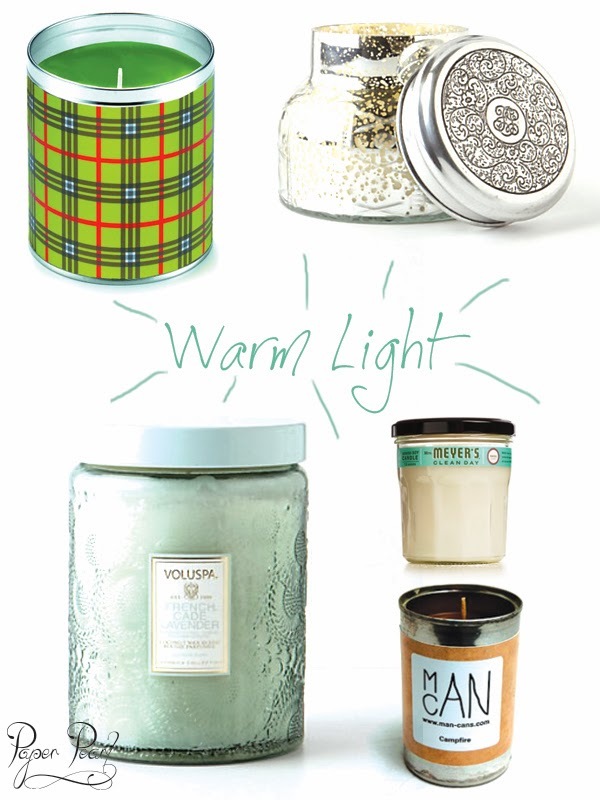 I love all of these candles above and their scents are all so different. Aunt Sadie's candles will fill up a room quickly-the tree smells are wonderful. Capri Blue Volcano will always always be a favorite of mine but I have a new favorite in Voluspa's French Cade Lavender. I love them equally. Mrs. Meyers has an array of wonderful scents but the Basil is so uplifting. I recently ran across the Man Can at Whole Foods and while I have never burned this one, the Campfire scent was exactly how you love a campfire to smell...that woodsy warm scent that even sticks to your hair when you go home.